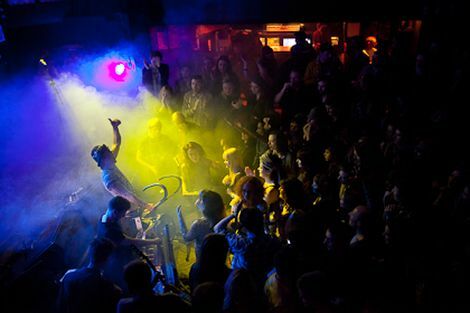 The Kazimier offer a sneaky peak into their New Year’s Eve plans – cosmic gold dust awaits. The Kazimier‘s long-awaited plans for the ultimate New Year’s Eve party is taking shape. It’s been months in the offing, but they’ve unveiled a brief teaser – The Kronos Begins. A night of performance, musical magic, spectacular theatrics and that characteristic Kaz touch are all on the menu. Our personal recollections of New Year involve watching a robot descend through the club’s roof while Michael Jackson moonwalked his way round the rafters as a giant Jaws shark crashed through a wall while the entire dancefloor boogied away to the Grease Soundtrack. Oh, and somewhere Freddie Mercury made an appearance. It’s that kind of affair. However, expect no repeats, the Kazimier are the artful dodgers of storytelling and this will be a complete one-off, here’s a brief trailer to whet your appetite. ‘On 31st December 2012 KromaVision will shoot the final scenes in the latest instalment of the trilogy sci-fi – THE KRONOS BEGINS. KromaVision Film Studios will become the set to the epic time-travelling tale of the Kronos, its birth and its captain’s plight to rediscover his interplanetary craft. Action will unfold throughout the night as scene-by-scene the film draws to completion. Every audience member will have a role as an extra, awaiting the director’s call. Tickets on sale 10am, Saturday November 17, £25. Book online or at Mello Mello Cafe. For more Getintothis coverage of the Kazimier you can read our end of 2011 review, our exclusive chat with the team, our review of their most ambitious project to date – Atalonia or watch and listen to the Atalonia video and soundtrack. In the meantime, watch Jack Whiteley‘s incredible visuals specially created when the Kazimier won the inaugural GIT Inspiration Award.